Universal Fan Con was meant to be a celebration of inclusivity and fandom. 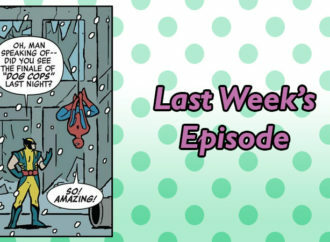 But as the show was unceremoniously canceled a week before it was expected to occur, fans are asking what happened. Many find themselves left out of pocket, having backed the Kickstarter and booked often non-refundable flights. 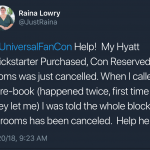 We, Rosie Knight and Jazmine Joyner, have compiled a comprehensive investigation into Universal Fan Con and what went wrong. 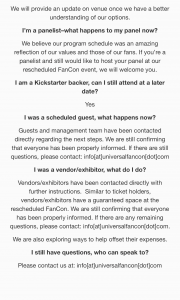 We’ve utilized the now-deleted Fan Con website, Twitter, Kickstarter page, interviews, and emails that were shared with us to put together this piece which we hope will help people gain a better understanding of what happened. For full disclosure Jazmine Joyner was approached by Jamie Broadnax in April 2017 to become an Accessibility Consultant for Universal Fan Con. She turned down the position due to lack of appropriate compensation for her time and labor. Joyner’s work on this piece was retroactively sponsored by the Harpy Agenda Grant. 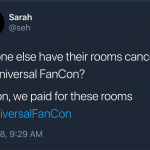 What was Universal Fan Con? This was the only time that Morris was mentioned; he was never included in any future programming, advertising, and never publicly mentioned Universal Fan Con. We’ve reached out to Mr. Morris’ representation for comment, but have yet to hear back. The Kickstarter included eight tiers, from $1 to $5000, and Fan Con achieved backers at every level. The prices seemed unusually cheap and didn’t appear to factor in talent charging for photos, as is regular at conventions. For example, their $10 pledge level, which had 275 backers, included: a Saturday pass to Universal Fan Con, a Photo Op with a celebrity guest, a digital copy of the Universal Fan Con Commemorative Program, and a personal thank you note from the Fan Con Team. For $35, you could get the same package but with a weekend pass for the show. That was the most backed tier, with 361 people supporting the con at that level. That means that, with just those two tiers, the convention was already promising to give away 636 free photo opportunities, which the Kickstarter FAQs stated you could choose yourself, meaning that every celebrity guest would have to approve giving away free time (the time taken for those photographs) and money (profit they would have otherwise made on those photo ops). At similar sized cons, a celebrity photograph would usually cost anywhere from $15 to $125, depending on who the photograph is with. This aspect of the Kickstarter seemed suspect, as photo ops are one of the main ways that celebrity guests make money at conventions. The fact that, though there were no announced guests, the team felt comfortable promising hundreds of free photos, was the first hint of what was to come. The $75 tier offered the same package as the previous tier, but with two weekend passes — which means you can add another 116 free photo-opportunities that celebrity guests were expected to give away. The $100 tier was the same as all the above but with three passes. It gained 50 backers, adding the free celebrity photo opportunities up to 802 and that number is, of course, multiplied if each pass holder gets a celebrity photo op, which is unclear from the Kickstarter page. Next was the $250 tier, which included all of the above and a night in a hotel, as well as “Special Con Swag” (the first of many vague rewards). This tier reached an unbelievable 13 backers. To anyone who has booked convention hotels before, this seemed like a too good to be a real deal, but also an incredibly risky one. 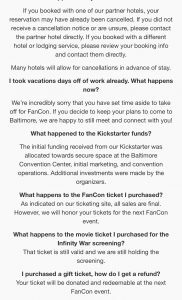 Hotels in the local Baltimore area (which none of the board members call home) can run anywhere from around $139 to $250 a night, so it seemed unlikely that Fan Con were leaving themselves enough money at their tier-level to actually run the con. 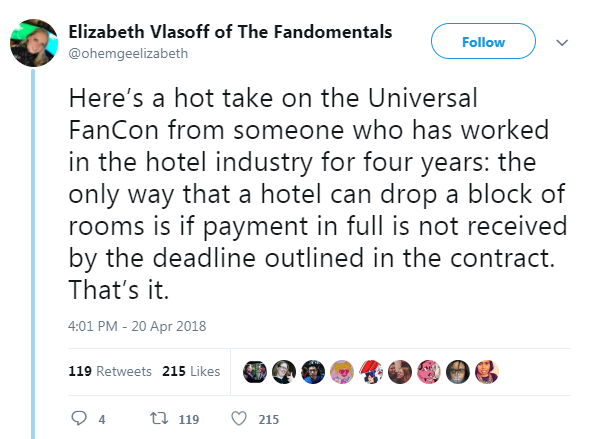 Especially as the next tier, $500, included passes and a hotel for two for two nights and “A Special VIP Experience for you and a Guest, and A Universal Fan Con Swag Bag” — more of the vagaries that the Fan Con Kickstarter dealt in. 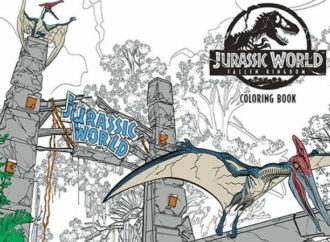 The fact that there were no specifications for these “experiences” or merchandise should have been a warning sign, but that didn’t stop people from backing the Kickstarter. What does any of that really mean? There is no way that you can offer random people “full backstage access” to a convention, on the most base level of security and health and safety. Also what constitutes “backstage” at a convention? From our experiences, they’re mostly made up of public halls, press rooms and the occasional green room, none of which are optimized for fan interaction. This tier also took the number of free photos to close to 1,000 — and added free autographs to the mix. The person who sponsored this level spoke out about it in a thread on Twitter after the convention collapsed. 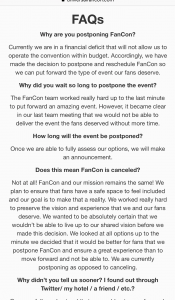 This directly contradicts pretty much every official and casual statement made by the heads of FanCon who have stated that the convention center took up most of their money and was the cause of the collapse of the convention. 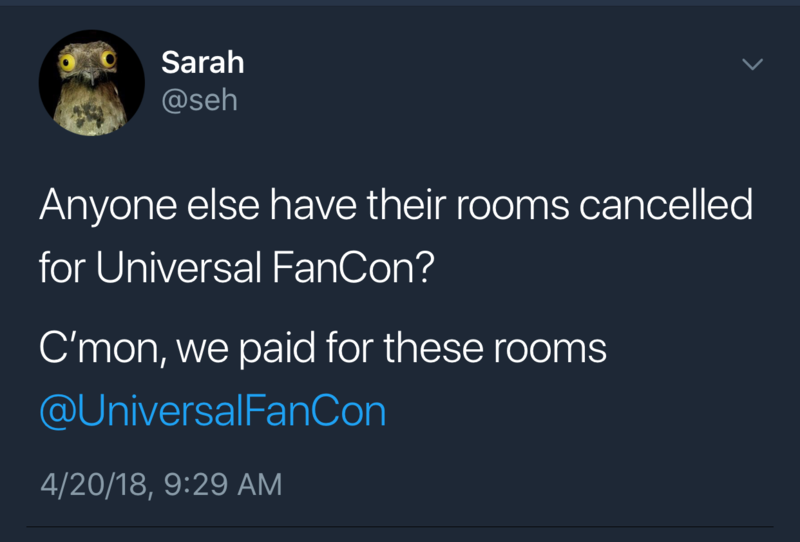 Who Organized Universal Fan Con? 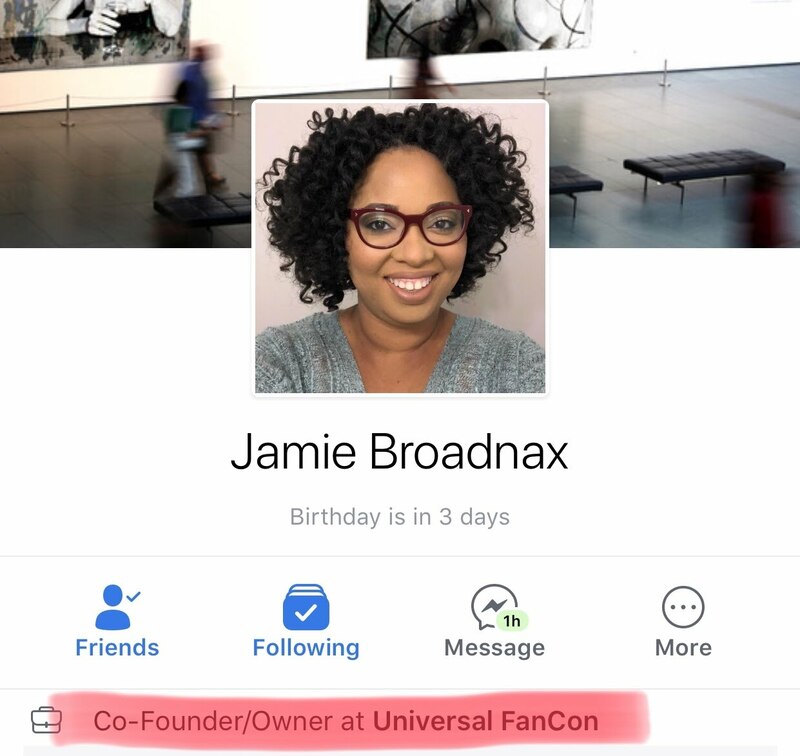 Jamie Broadnax (best known for running Black Girl Nerds) was most currently listed on the Universal Fan Con site as “Director of Community Outreach,” but was initially listed on multiple platforms including her own Facebook, LinkedIn, Twitter, and the Universal Fan Con Kickstarter as the Co-Founder of the convention. 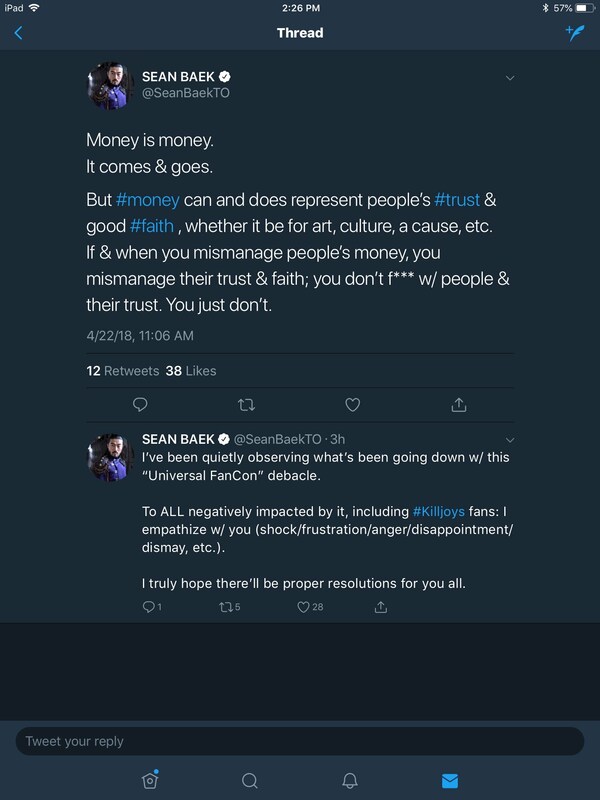 At this point in time, Broadnax last made a public statement denying any knowledge of internal and financial workings of Fan Con, as well as multiple tweets to the same effect, though her name was signed to both the announcement email sent to backers and the official statement. Broadnax’s LinkedIn profile also contradicted her statements, listing a number of executive responsibilities including, “Oversees executive leadership meetings” and “Approves executive and any final decisions by founding board members.” Currently, all traces and mentions of Fan Con before the cancellation have been erased from the Black Girl Nerds’ Twitter feed, and as of late April the details have been deleted from Broadnax’ LinkedIn account. Robert Butler (CEO, The Black Geeks, last updated October 2017) was listed as “President/Executive Director,” and is another of Fan Con’s self-proclaimed Co-Founders, along with being a very vocal presence on social media promoting the con. He is the listed creator of the Universal Fan Con Kickstarter. 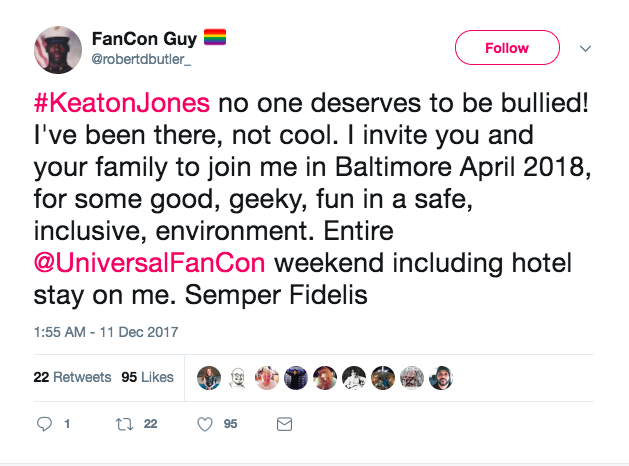 He made multiple statements on his Twitter, @DarthGeekonius (though he also tweeted for Fan Con as @robertdbutler_), about the con needing money and about the eventual cancellation of the show. Butler and Broadnax were widely reported as co-founders of this event. Though the Fan Con website is gone, references to this fact can be seen in articles, such as this one, from late 2016 to early 2018. Peter Matise was listed as “Vice President of Business Strategy.” Thus far Matise has not made a public statement on Universal Fan Con and hasn’t used his Twitter account since February this year. Details on his involvement will be discussed later in this report. 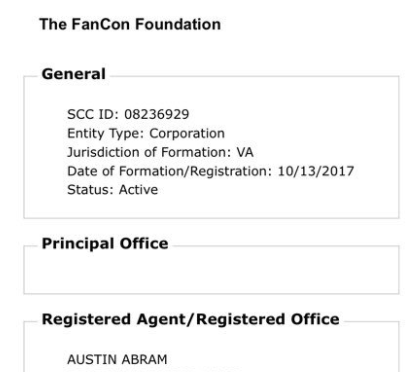 Austin Abram was listed as the Financial Director of FanCon and is named as the person who registered both Universal Fan Con and The FanCon Foundation as a corporations on the Virginia State website. 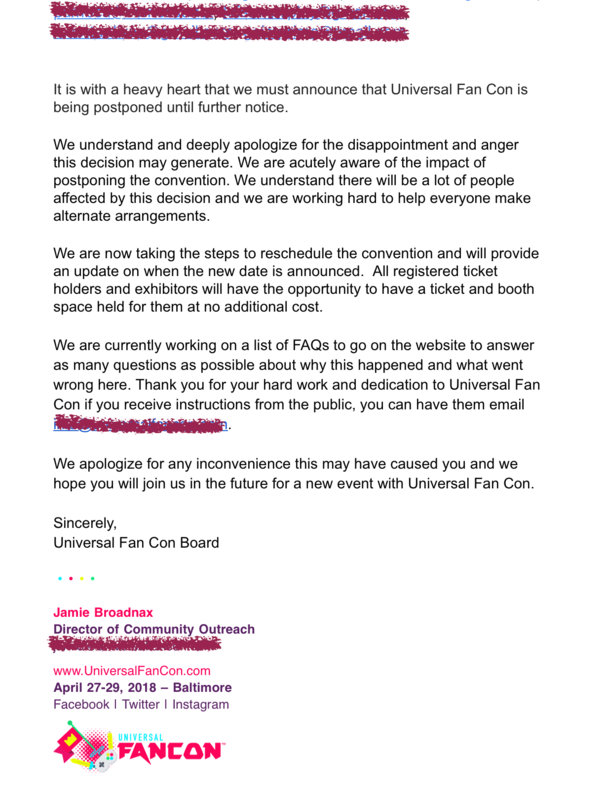 Abram has no social media presence that we could find and has yet to make a statement about the collapse of Fan Con. Pham was involved with PrideCon, which was an LGBTQ themed convention planned for Anaheim, CA in 2016. Pham ran a Kickstarter alongside his partner, only known as Long, and they raised $15,000. But, as was reported on Social Blade, the convention never actually happened. 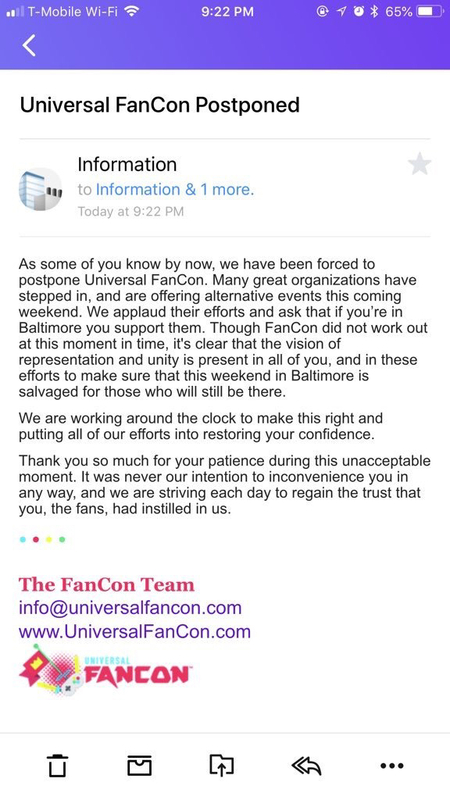 In fact—just like Fan Con—the show was canceled after reaching out on social media for money to help “save the convention.” PrideCon’s cancellation letter blamed an inability to pay for hotel booking as the final nail in the convention’s coffin, and just like Fan Con’s (now edited) first statement, PrideCon announced that there would be no refunds for backers or ticket holders. 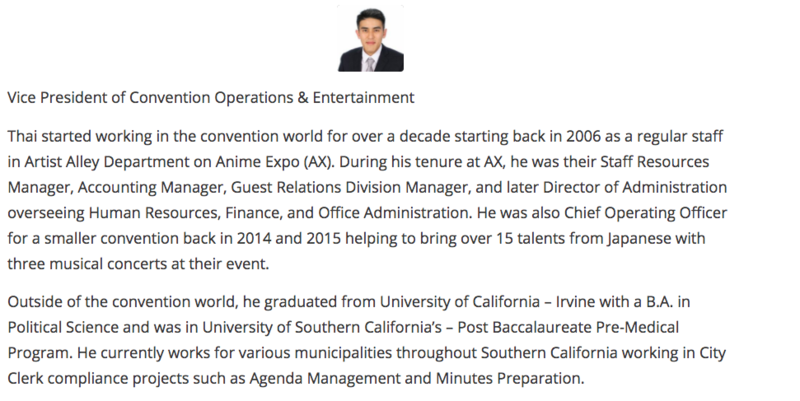 We were also tipped off by an anonymous source to look into TouhouCon, and learned that Thai Pham was the COO of Touzai Company which ran the convention. TouhouCon ran for two years from 2014 to 2015. The Daily Dot reported the convention failed to deliver on the promises to its vendors and creators and shut down in 2016 due to lack of funds. 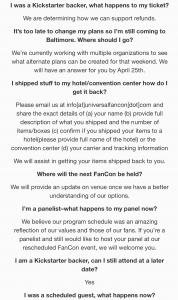 Though Universal Fan Con has defended Pham in Instagram and Facebook posts and claimed that he wasn’t involved in the interior workings of the convention, the questionnaire that was given to potential “special guests” included multiple mentions of PrideCon. 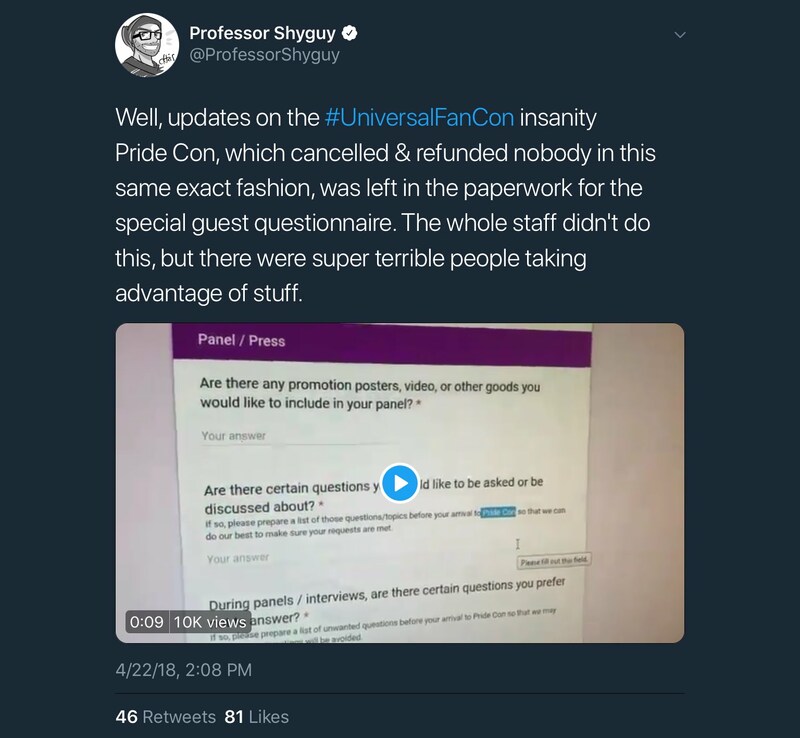 Twitter user @ProfessorShyguy highlighted this when he tweeted a video of the questionnaire which suggests that Fan Con recycled questions from the canceled PrideCon, forgetting to swap out the old convention for Universal Fan Con. Thai Pham has yet to make any public statement and has an inactive Twitter profile and no other social media presence. As with many of the higher-up members of Fan Con’s organization, it’s hard to determine how he was involved or what he did for the convention as he has never publicly spoken about it, and was only ever named on the website. 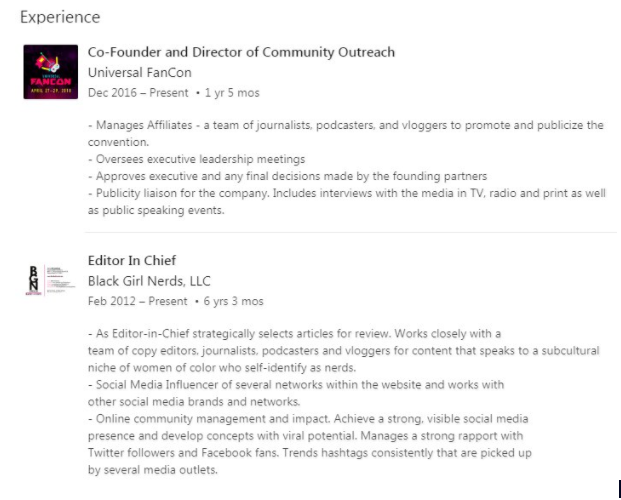 Ron Roecker, who was listed by Universal Fan Con as “Vice President Public Relations and Corporate Communications,” is a self-proclaimed “Grammy Expert,” Though it’s hard to find concrete evidence of what he does or—like many of these those listed on the Fan Con site—what he actually did for Universal Fan Con. We did find a couple of now defunct YouTube channels where Roecker spoke about himself as a sort of musical self-help guru and children’s book author. He is listed as the head of the apparently non-existent [EDIT: please see the foot of this piece for update] non-profit Fan Con Foundation on the Wounded Warrior Fundraiser page, where the event is advertised as a fundraiser for the Special Olympics, Autism Society of America, Boys & Girls Club of Metropolitan Baltimore, Wounded Warrior Project, and The Arc of Baltimore. Roecker has made a very vague comment on the Universal Fan Con cancellation in Facebook comments. 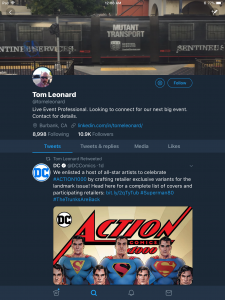 Tom Leonard was listed on Universal Fan Con’s website as Vice President of Marketing and Sales. His website claims he has over either eighteen or twenty years of experience in online marketing. In our investigations of Leonard, we discovered something odd about his Twitter presence. 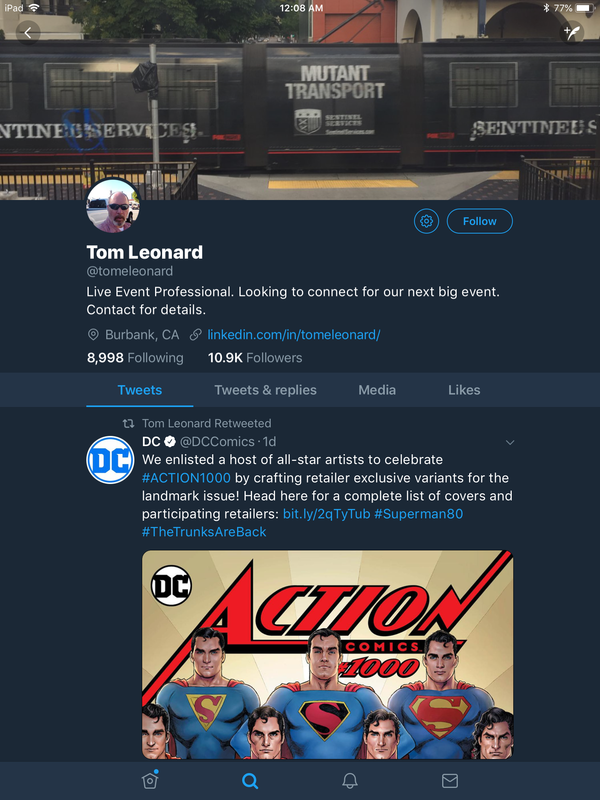 We found multiple “Tom Leonards” on Twitter, each either sharing the same photo shown on the Universal Fan Con website, or a different picture of the same man but bearded, advertising different brands. 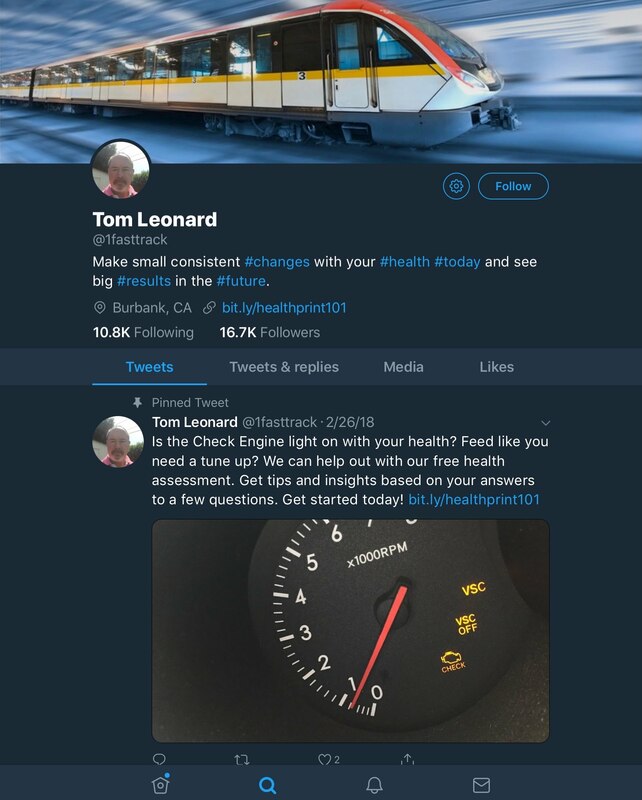 We combed through all the Twitter profiles threads, and we eventually concluded that VP of Marketing and Sales Tom Leonard might be a bot account that brands can hire, and not actually a real person at all. 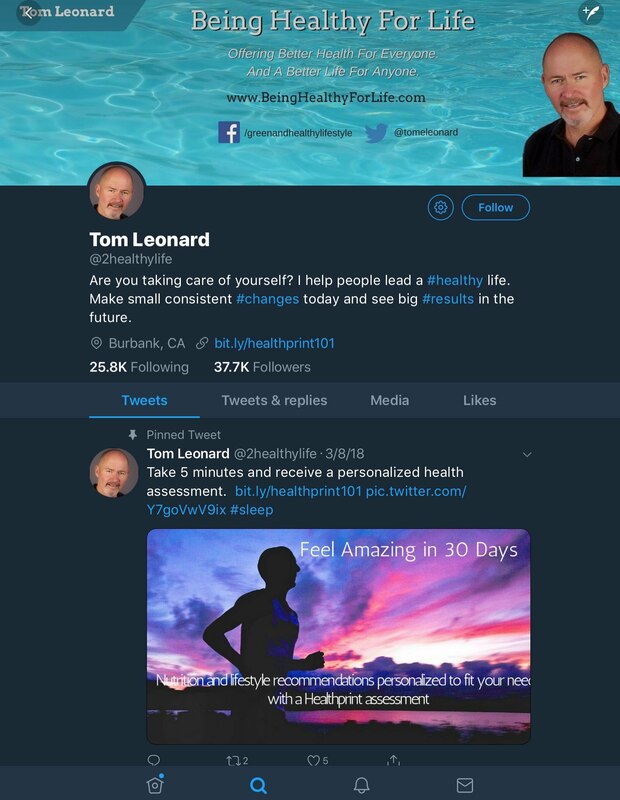 Visible above are the Burbank, CA location shared by all three Tom Leonard profiles; the first and second accounts pictured share a common bit.ly link in their “website” field, whereas the second and third share the image of a sunglasses-wearing Tom Leonard. 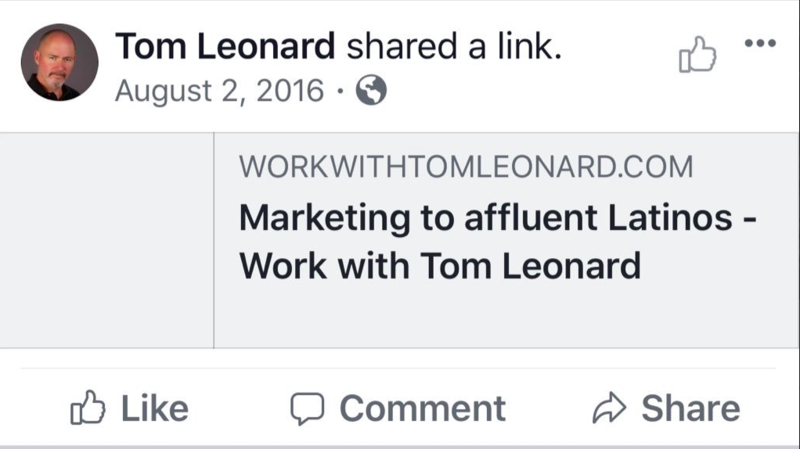 This Tom Leonard Facebook profile advertises FanCon merchandise (still on sale as of April 24th 2018). 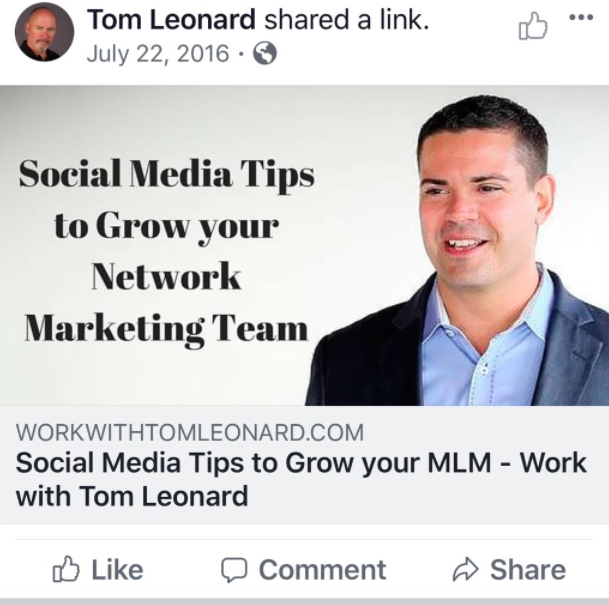 Whilst further researching “Tom Leonard” we discovered that he runs Multi Level Marketing schemes, which is another name for a pyramid scheme. 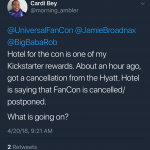 On April 20, 2018, Kickstarter backers began to receive notifications from one of Universal Fan Con’s “Partner Hotels” indicating that the rooms which were part of their Kickstarter backer rewards had been canceled— along with the convention itself. 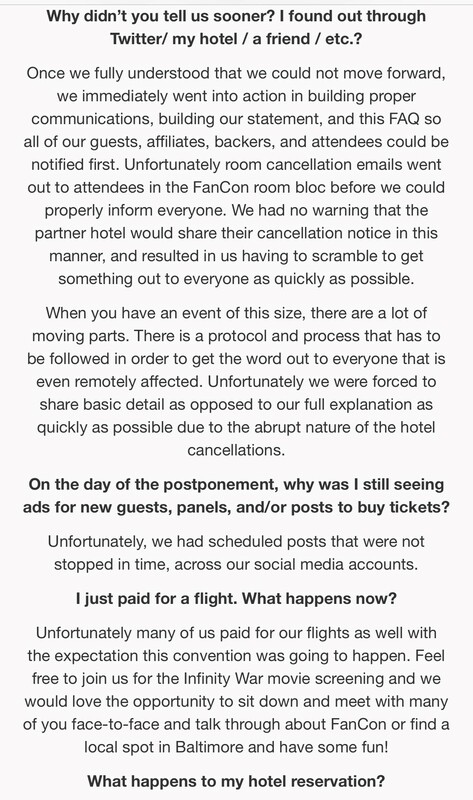 It should be noted that a hotel would be in breach of their contract if they suddenly cancelled an agreement with a client for no valid reason, as indicated by Elizabeth Vlasoff, a hotel industry employee, and corroborated by event planners we have spoken to. It was unlikely that the hotel violated any protocols in releasing its reservations. 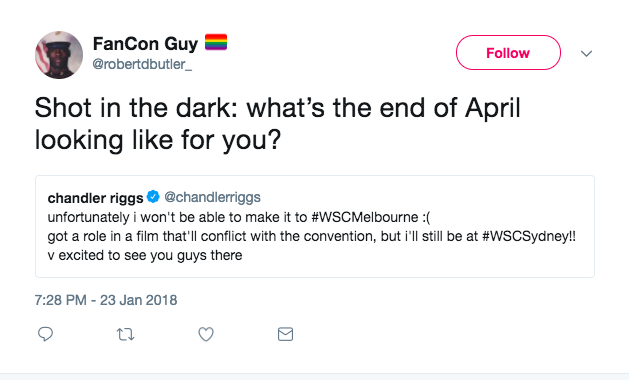 Distraught and confused, Kickstarter backers took to Twitter to voice their worries with Fan Con, only to be met by hours of silence. It wasn’t just the people who had believed in (and gambled on) the Kickstarter though, as many of the volunteers and people involved with the show were just as confused. 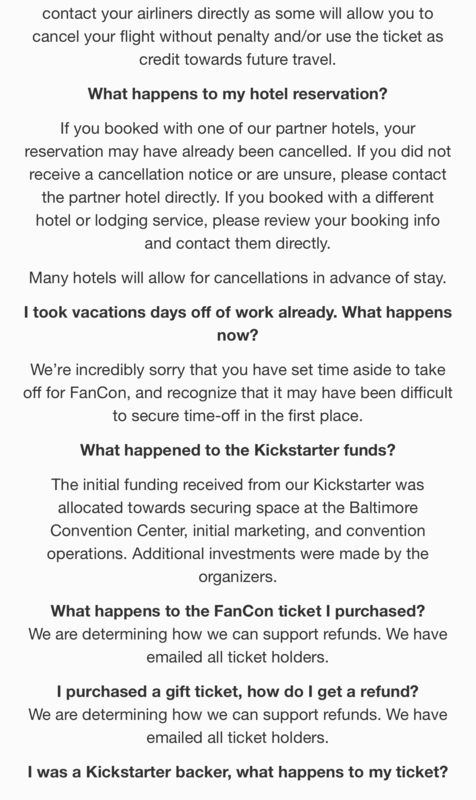 Later that morning, many hours after the news broke on Twitter, Broadnax sent an email to all Kickstarter backers confirming the cancellation of the con. Instead of BCCing all 500+ backers she CCed them, effectively leaking the personal emails of hundreds of people. There has not been an apology issued for this leak as of Monday, April 23, 2018. Several parts of the FAQ page were later updated, likely in response to adverse reactions on social media. You can see all versions of the FAQ below. Though much of it was changed, the organizers didn’t adjust the “All sales are final” part of the FAQ, sticking with their no refunds policy. 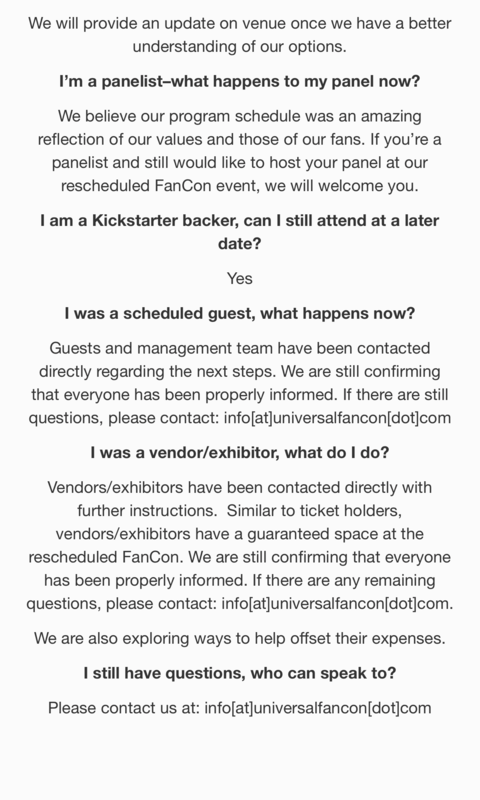 However, on the morning of April 21st, some vendors received emails from Universal Fan Con stating that they were working hard to refund vendors’ investments and that they will continue to update the vendors. No updates have been made to the vendors regarding refunds at this time. 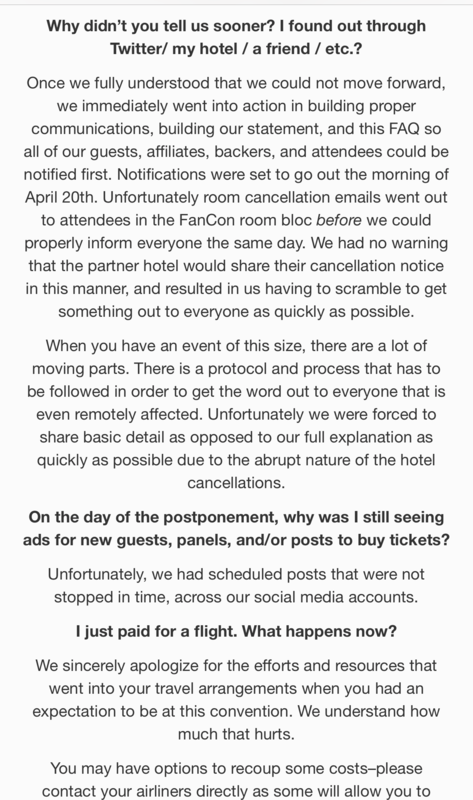 The hotel cancellation emails seemed to have forced Universal Fan Con’s hand, but this raises the question of when they had intended to tell their staff, volunteers, guests, and patrons of the convention’s cancellation. 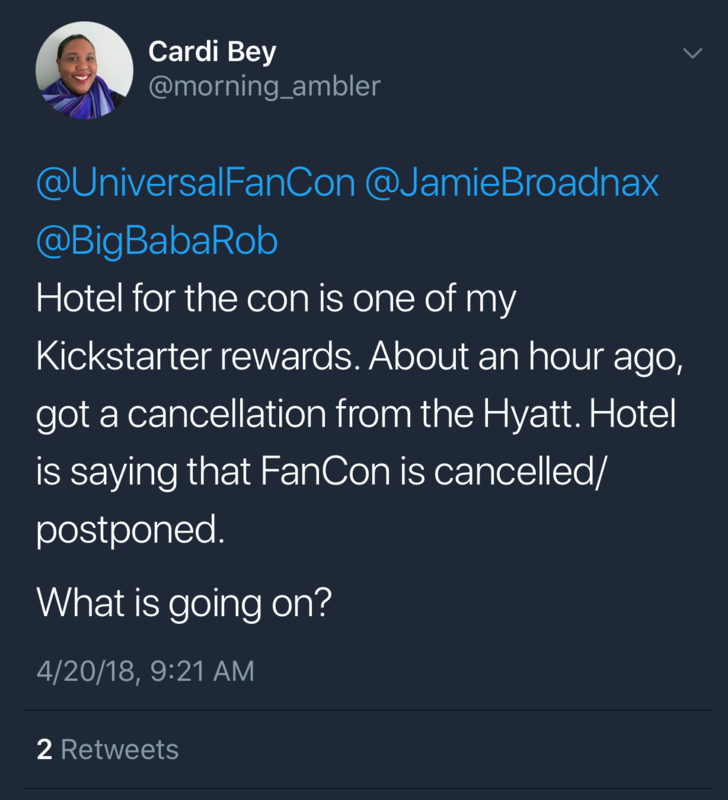 Though Broadnax claimed not to be involved with financials or know that the con was in trouble, there are multiple tweets in which BGN, and Jamie Broadnax’ personal twitter contacted brands and causes célèbre on twitter asking for their support mere weeks before the cancellation. The other cofounder, Robert Butler (on each of his two accounts), did the same. After the cancellation was clear, Butler also began to tweet erratically, claiming that if the con failed it would be the “fans” and “Baltimore’s” fault. 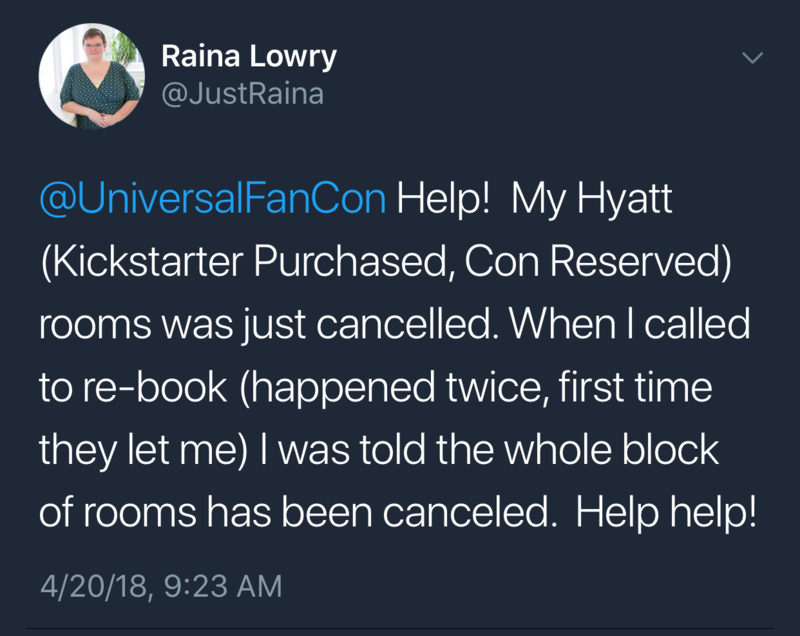 Within hours of the word spreading via Twitter about hotel cancellations and then the convention cancellation, vendors, Kickstarter backers, ticket holders, and guests came forward to show their distress at how Universal Fan Con higher ups handled the PR for this situation. 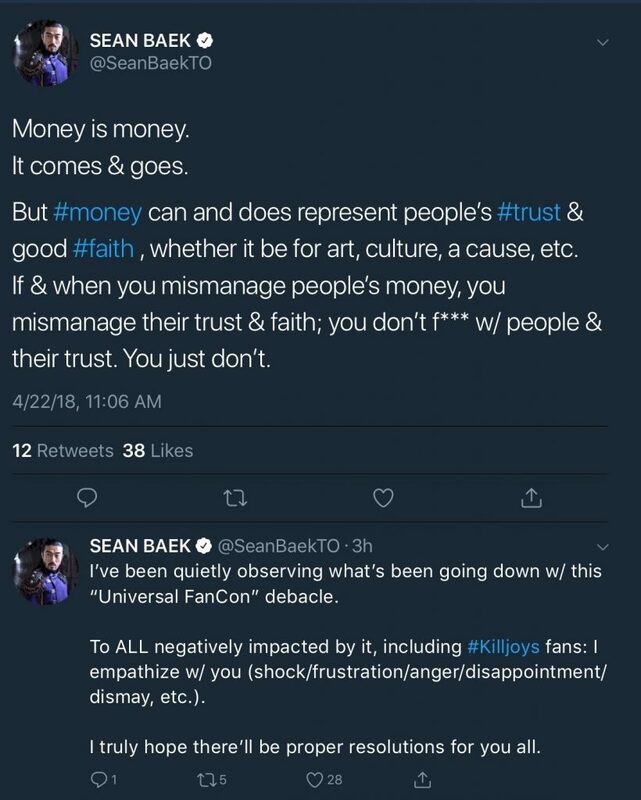 Actor and scheduled guest of Fan Con, Sean Baek from Killjoys, came forward on Sunday, April 22nd on his personal Twitter account to express his disappointment in the handling of the vendors and backers concerns by the Universal Fan Con staff. What Do We Know About the Business? 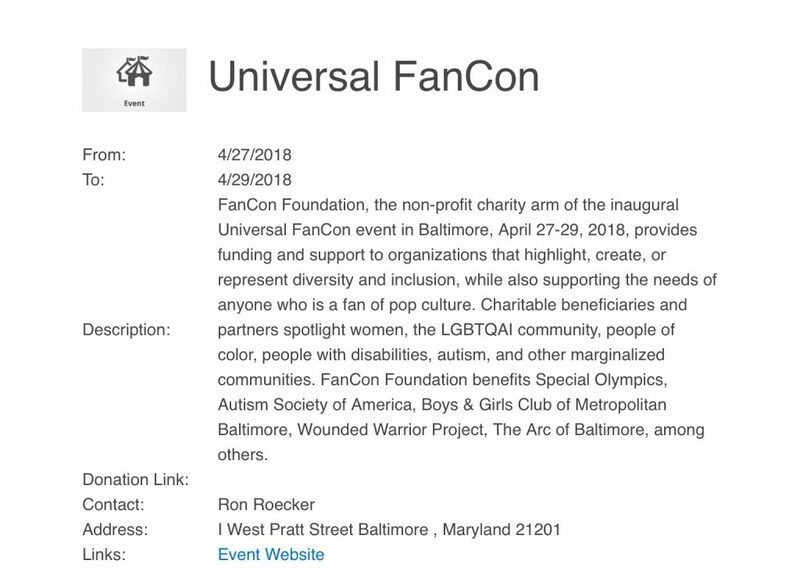 Universal Fan Con was registered as a corporation on July 13, 2017 by Austin Abram, Financial Director of Fan Con, and the site lists a private address in Virginia (not Baltimore) as the location of the corporation. The Virginia government website also states that the company got 25,000 shares approved, which contradicts the statements from all parties that the convention would be run voluntarily, with no payment for any parties. It’s also worrying as we know many parties were asked to work for free without ever being offered any of these 25,000 shares. So the question is: who does hold them? 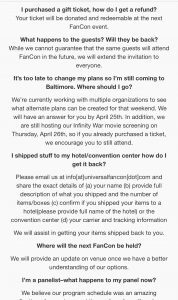 This email, from Tatiana King-Jones, Deputy Director of Community Outreach, and sent on March 9, 2018 (weeks before Broadnax claims to have known that the con was in trouble), explains that Fan Con needed to sell 18,000 tickets and if they achieved that, they would share the estimated $150,000 profit with all active affiliate groups. Broadnax has stated in her public response on the Black Girl Nerds website that, “I did not involve myself with financial or legal matters. To be frank — I didn’t know what was coming in nor what was going out. 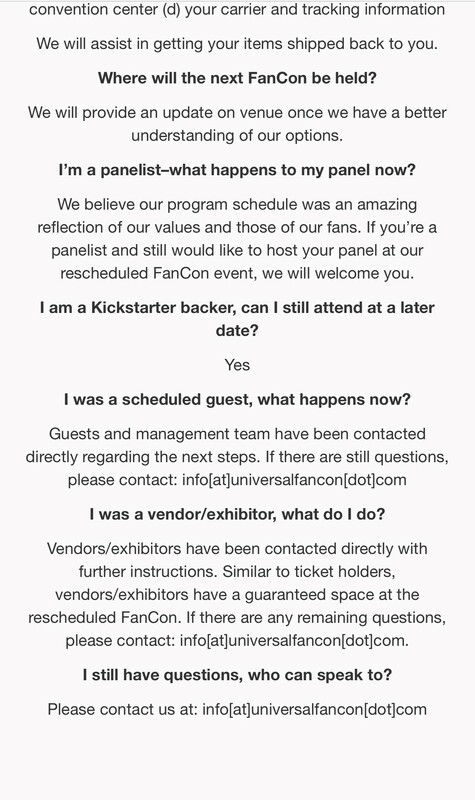 I didn’t sign any contracts.” Not only does this email clearly disprove that, but it also establishes that Fan Con was expecting to make a massive profit, which is not only incredibly optimistic and unlikely but means the con was actively lying to its volunteers about the fact that no-one would be getting paid. In the first draft of Jamie’s statement on BGN, she stated, “I was never paid, but promised part of the profits.” Statements Broadnax has released publicly have contradicted one another, or themselves, leading to mistrust and unease for people who believed in her brands (or wrote for them). Jamie Broadnax original statement where she notes she was promised part of the profits— volunteer work is not undertaken with a belief that one shall see eventual profit. 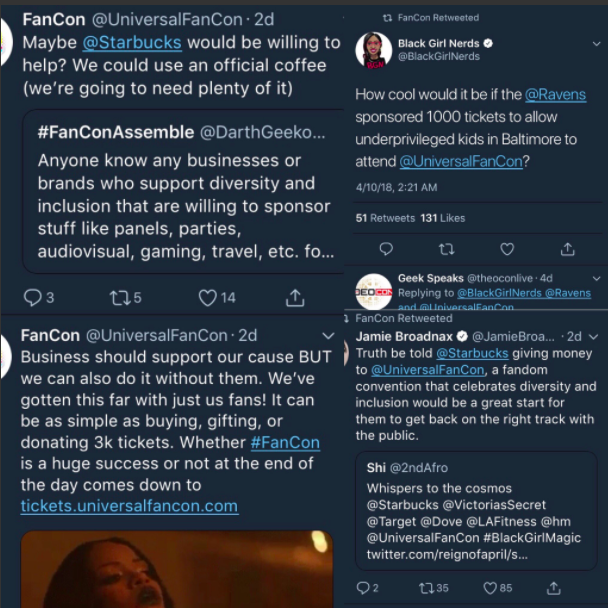 In February, Fan Con claimed to have established a nonprofit arm which they promoted online, and sold merchandise that they stated would go to their Fan Con Foundation. When we searched the Virginia Gov website, we found that Fan Con Foundation was registered as a corporation, but according to the “IRS exempt-organizations-select-check” Fan Con never filed the 501(c) paper work needed to become a nonprofit and are not listed as one on any government site. 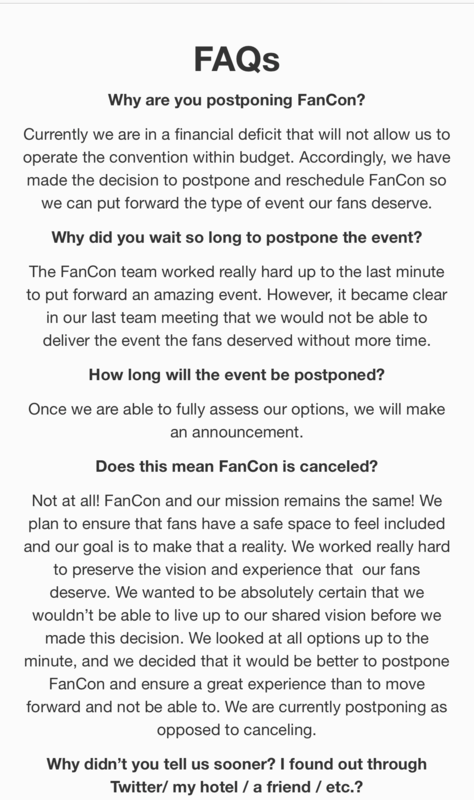 This would mean that, at publication, both arms were still for-profit organizations, despite the assertions of the founding members of FanCon. Also, state laws demand that all nonprofits must have at least three directors but all of the Fan Con founders who have spoken out have claimed to have no idea of the financial dealings of the show, let alone the foundation. This also lines up with our statement from freelance writer Joi, who cut ties with Fan Con after discovering that they hadn’t filled out the correct paperwork to be registered as a non-profit. 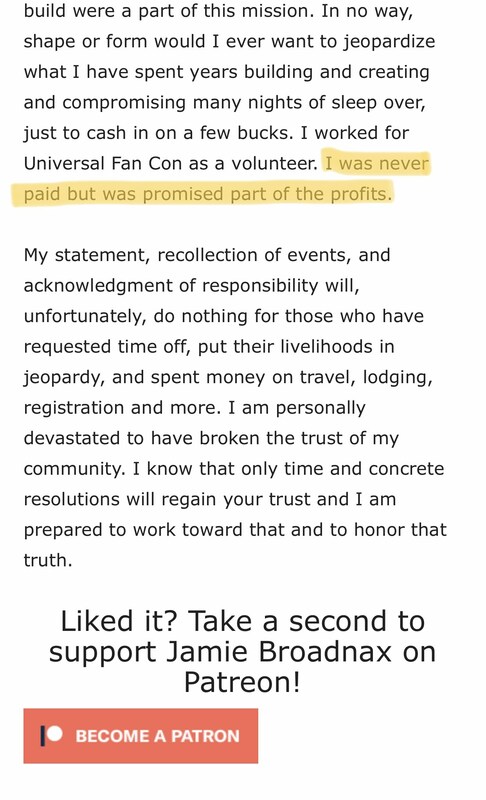 Robert Butler stating that Universal Fan Con has a Foundation. 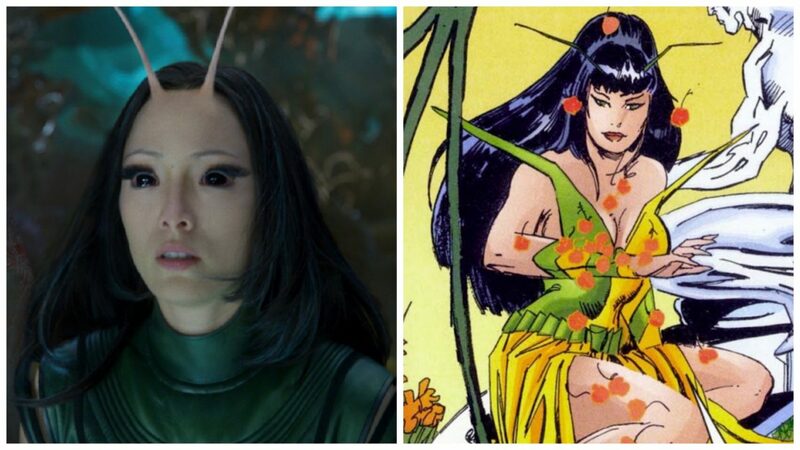 We spoke to Joi, who was approached about sourcing funding for a potential very high profile speaker for Fan Con Foundation. 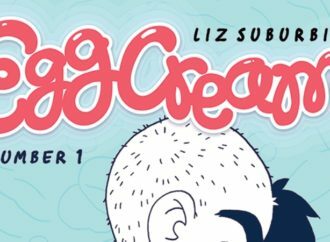 “I was a podcaster and writer for Black Girl Nerds for about 2 years. I left the organization on March 1st, 2018 but was introduced to the announcement of Fan Con through them. 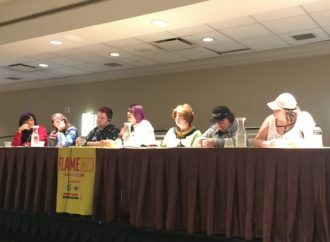 The concept of Fan Con sounded amazing: a convention that celebrates nerds from marginalized communities? Sign me up! I donated $75 which granted me 2 weekend passes and one of those passes would be for life. I work in corporate and the business structure of providing “for life” passes didn’t seem sustainable. However, because $75 wasn’t an amount that would cause financial hardship for me, I supported and waited for the event. 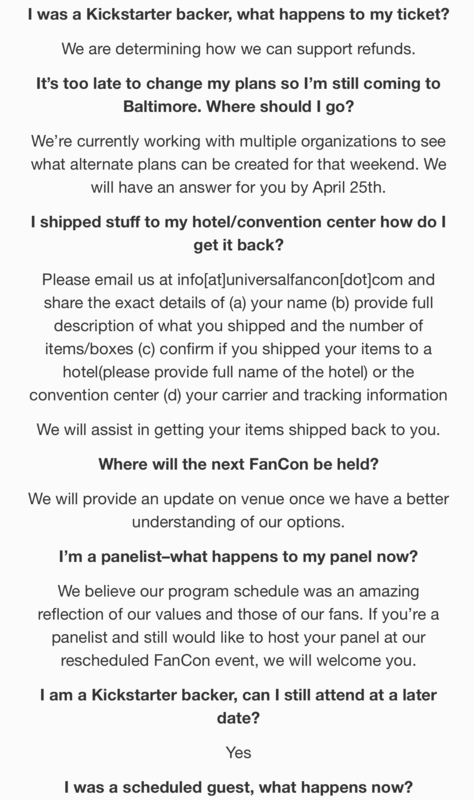 “In Sept 2017, I received a message from Kyndal, who was at the time the Associate Director of Business and Strategy for Fan Con (Kyndal is a friend of mine). There was a request from Peter Matise, [who] was Director, now VP of Business and Strategy, to speak to me re: potential sponsorship from my company. Kyndal asked on behalf of Peter to talk about the sponsorship opportunity as because she’s a friend of mine; I set up the meeting. “Peter, Kyndal and I discussed the sponsorship opportunity: it was a guest speaking situation with Michelle Obama for the first night of the con. Based on Peter’s account, they wanted a sponsor that the Obama team could vet and pay for the speaking event. He was asking for $250,000. I sent the information to a senior brand employee at my company and discussed it with them. They believe the sponsor request was too high and I agreed. But trying to be helpful, I recommended they reach out to another company connection I had and provided that information to them (after getting consent from the contact). 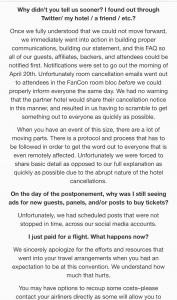 “Shortly after sending the note, I received a message from Kyndal informing me that the Fan Con team did not have their 501c3 paperwork completed. I don’t work in the non-profit sector so at the time, I had no clue what that paperwork was. However, incomplete paperwork was all I needed to hear to let Peter know that we would not be moving forward with the process. I sent him an email letting him know this and I still have all those emails for reference. Peter sent me a follow up email in September and November, both of which I didn’t respond to. 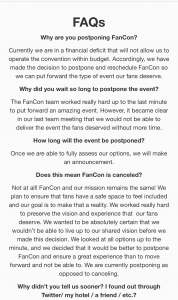 Kyndal left the Fan Con planning team shortly afterward as well and I thank her for letting me know that they did not have their paperwork together. “Even then, I still planned to go to Fan Con because I paid money and had tickets. I changed my mind after they moved the Infinity War date to the same weekend and I wanted to see the film with friends. Since my Kickstarter backer perks included one free ticket “for life,” I had an opportunity to go next year. But now that the event is postponed and I’ve been a part of the lack of professionalism via one of the cofounders emailing 100s of people without BCCing, I no longer want to support. I have yet to receive an apology from the team releasing multiple personal emails. “Now that the con has been postponed and I said my piece on social media, my questions have now been focused on Peter Matise and the fact that he has yet to make a statement and is listed as Director of Business and Strategy. If you didn’t have the 501c3 paperwork together for this in September of 2017, did it ever get processed? And if so, what happens now that you’re not having the event? Rosie Marx tweeted that Fan Con did have a non-profit arm called Fan Con Foundation. This was new information to me, and I am even more concerned about what will happen to that non-profit arm. 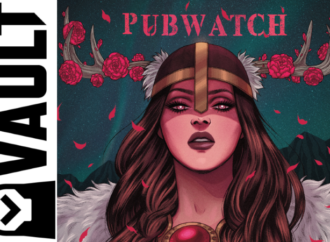 We’ve spoken to a number of Fan Con vendors, Kickstarter backers, and volunteers about their experiences with the show. 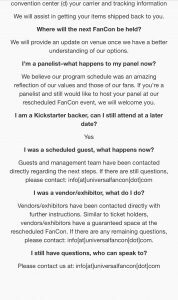 We’ve reached out to the business leaders of Fan Con and some of their affiliates, but they have yet to respond to our requests for comment. Holli Michele saw Fan Con as a chance to expand her experience with conventions and signed up as an exhibitor. “Basically, I signed up for Universal last fall because I was trying to do more events (I had recently lost the shop space where I’d had a vintage clothing business for 6 years). It was local (I’m in DC) and had a mission statement I supported, so it seemed like a good idea. Didn’t really think about it that much other than to put it on my schedule and work on extra inventory for it. Then on Friday afternoon I got a text from my housemate that it was cancelled,” Michele shared. After all this research, it’s still not clear where the money was spent. The organizers have not responded to requests for comment. During this investigation, we have spoken to lots of people involved in the con on and off the record, yet no one seems to know where the $56,000 from the Kickstarter went, or where the personal money that Butler claimed was spent went. 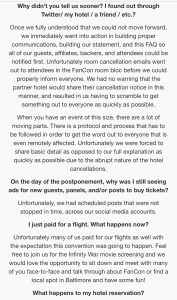 Though we attempted to contact the convention center they weren’t accepting calls or questions, which has lead to a guessing game online with people stating numbers from 25,000 to one million as the price of the center, whilst the organizers stay silent. 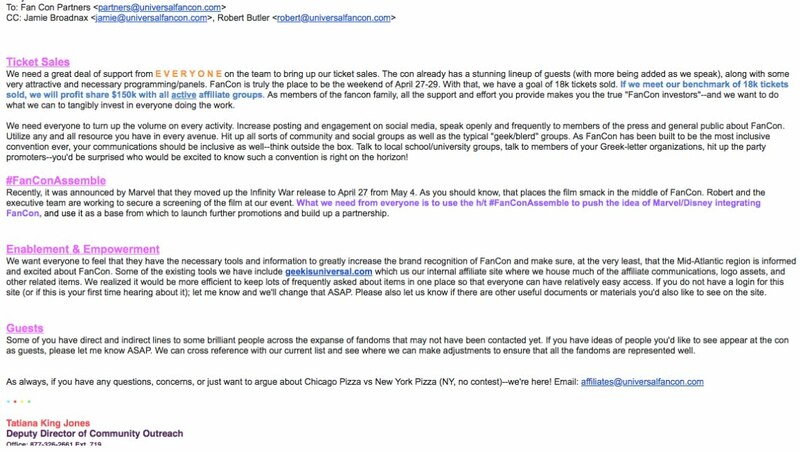 Beyond the mystery of Fan Con’s finances, the con sold merchandise and advertised on charitable websites as a nonprofit though they were never actually structured as one. This is at best, unbelievably negligent and at worst possibly illegal, as the convention not only misrepresented themselves, but also misappropriated the funds that they raised under the guise of being a nonprofit. At this point, I'm not gonna be the one to sue them, but I promise you people that 1) were really depending on this to make money or 2) stood to make a lot of money from their appearance are well within their rights to do so. Though the situation has left behind a distasteful legacy, many people still believe in the spirit of the event, which is one of diversity and unity across all fandoms. 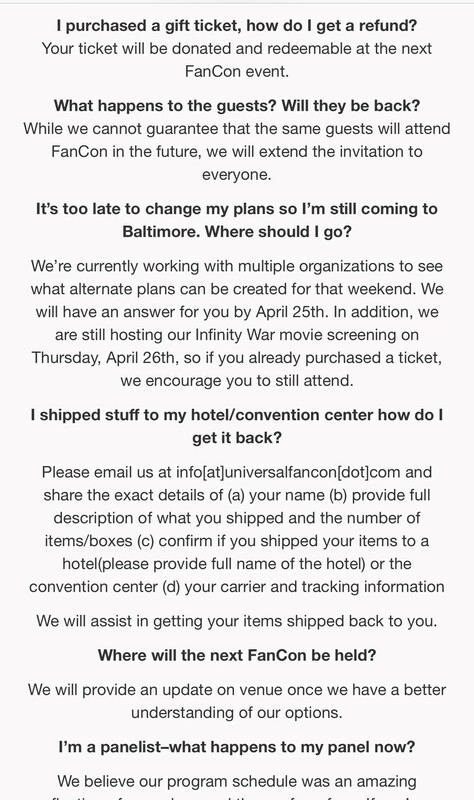 Many people affected by the cancellation have banded together to create pop-ups, online store listings, and guides to what you can do if you find yourself in Baltimore next weekend with no idea what to do, while other conventions and venues are showing their support for the convention’s orphans. As new information becomes available and can be verified, it will be added to the bottom of this piece. We spoke to the Virginia State Gov and verified that Fan Con Foundation was in fact registered as a nonstock corp in October 2017. As a Virginia nonstock corporation, the Fan Con Foundation is prohibited from distributing profits to directors or members except as reasonable compensation for services rendered or as part of the liquidation process. 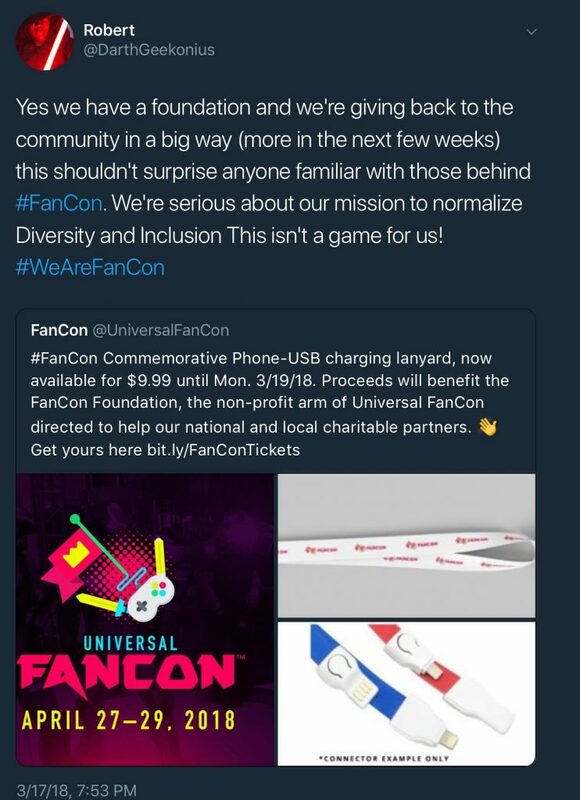 As such, The FanCon Foundation was required to keep its finances separate and apart from those of Universal FanCon Corp. 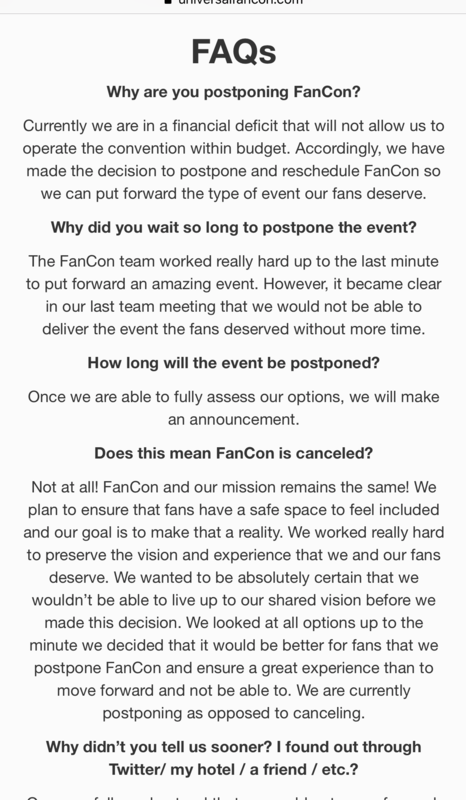 According to information currently available, there is no evidence that The FanCon Foundation ever applied for tax-exempt status with the IRS or the Virginia Department of Taxation. The Fan Con Foundation paperwork also introduces a new name, Karon Tunis, who is the Manager / Producer of Orlando Jones’ Drive By Entertainment according to her LinkedIn. Jones and his camp have stayed entirely silent during this debacle despite early support for the con, though he appears to have deleted all mention of it from his Twitter and has not spoken publicly about it for months, though the show was still advertising him as a guest until it’s cancellation. The dates on this paperwork appear to match those that would be expected, but we have yet to fully corroborate and verify this new information. EDIT Thursday, May 10, 2018, 1:00 p.m.
We can confirm that Butler and Abrams are indeed named in the incorporation of “Universal FanCon Corporation,” with Abrams listed as the registered agent. Despite again trying to contact Butler and Abrams, we have had no response and are still not able to determine how Universal Fan Con funds were spent. 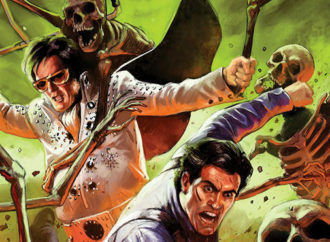 However, in a recent Vulture piece, Butler “estimated that they ultimately raised a total of around $150,000 from ticket sales (between mid-March and late April, they increased sales, eventually selling around 1,700 tickets*), vendor and exhibitor fees, the corporate sponsorship, and the Kickstarter campaign, and said he could account for approximately $250,000 in spending. But he was sure he was forgetting some expenditures, and he estimated they owed hundreds of thousands more to contractors and guests who had yet to collect on these debts.” According to the Vulture article, no financial documentation was provided by Abrams and Butler for legal reasons.